This ship, built by Chantiers et Ateliers de Provence at Port de Bouc, was originally intended to serve in CGT's West Indies service. Thus, when launched in 1914, she was named Isle de Cuba. However, before she was completed, she was redesignated for the New York service and renamed Lafayette. 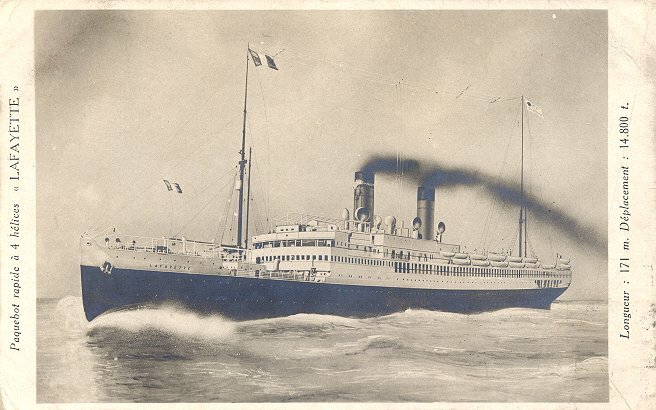 Her maiden voyage to New York on 3 November 1915 began not at Le Havre, but at CGT's wartime terminus at Bordeaux. 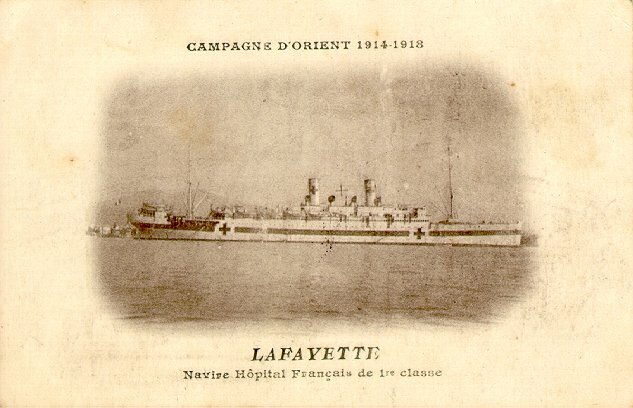 Early in 1916, Lafayette was taken over as a hospital ship, and is pictured below in that livery as well. She returned to CGT in 1919 and made her first New York departure from Le Havre on 8 November. In 1924 she was transferred to the St. Nazaire-West Indies-Central America service, with occasional New York trips. She was rebuilt in 1928, placed on the Vera Cruz service and renamed Méxique. She remained on that service, with occasional trips to New York and Casablanca, until the summer of 1939, when she was laid up in anticipation of being scrapped. She returned to service, however, to carry Jewish refugees to Mexico until she was taken over as a troop transport in 1940. On 19 June 1940, Méxique sank at Le Verdon after striking a mine. Her entire crew of 173 was rescued.